Microsoft CEO Steve Ballmer introduced three new Windows Phone 7 smartphones at the Microsoft second annual ”open house” press conference in New York. The latest editions by the company would be exclusively available on the super fast AT&T network in the U.S, this holiday season. The three smartphones would be available at an attractive price of $199.99. HTC Surround, LG Quantum and Samsung Focus, each comprising touch screen for the users, a 5-mega pixel camera and a 1GHz Snapdragon processor has been added to the Windows Phone 7 lineup. The HTC Surround which is being deemed as the most powerful amongst the lot, has a 3.8-inch touch screen with a data storage in form of internal memory of 16GB. It also has the honor of being the first smartphone that is fitted with Dolby Mobile Surround Sound Speakers. Whereas the strong and powerful HTC Surround is best for fun and work, the LG Quantum is specially designed for business professionals with a slide-out QWERTY keyboard and Office Mobile on board. Whereas the smartphone is designed for business professionals it does deliver some place for play which can wirelessly stream videos, music and photos to any DLNA enabled TV or other device. 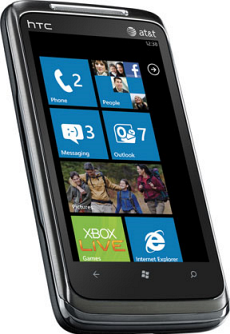 Samsung Focus is one of the slimmest Windows Phone on the AT&T with just being 9.9mm thick. The smartphone comes with a Super AMOLED screen with features like the Samsung Galaxy S.
While Microsoft revealed the the Samsung Focus would be available from AT&T retail stores starting November 8, no specific date was announced for the HTC Surround and the LG Quantum. 3 Windows Phone have already been launched but still await the rest of six handsets which the company promised would be available from 60 mobile operators in over 30 countries.